Introducing our Bare Bottom Sheets for your Twin XL bed specifically made for keeping you incredibly comfortable and cozy warm all winter long while still being insanely comfortable college extra long twin sheets! Our Bare Bottom sheets are incredibly soft -- think of a mix between jersey and your favorite athletic wear -- but yoga pants won't keep you warm in the middle of winter. 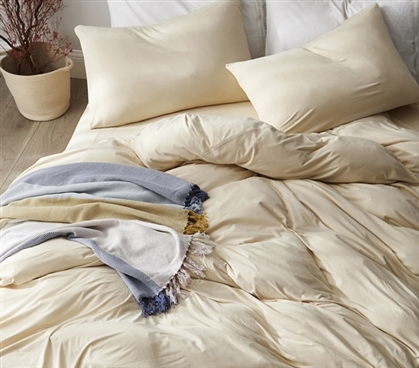 Rather than giving up your super soft sheets for itchy flannel, upgrade to our Winter Warmth. Our gorgeous custard cream brings together the whole look-- bright, fun, and reminiscent of donut fillings -- our insanely soft Winter Warmth Bare Bottom Sheets in Twin XL is the physical embodiment of all your favorite things. So, go ahead, treat yourself with freakishly soft sheets, guaranteed to keep you warm all winter long, and fall crazy in love with your Twin XL dorm bed!